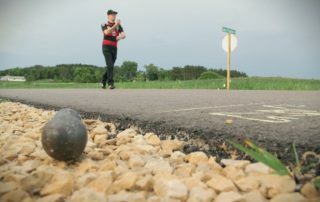 A classic Wisconsin activity is making its ways into the world of high school sports. 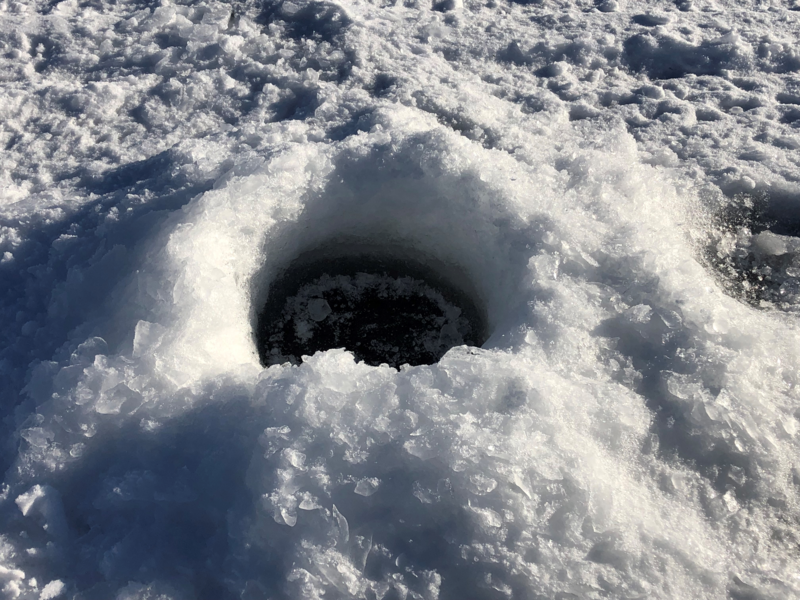 Ice fishing teams are popping up in schools across the state. January 5th marked the first high school ice fishing tournament of 2019 at Bone Lake in Luck, Wisconsin. 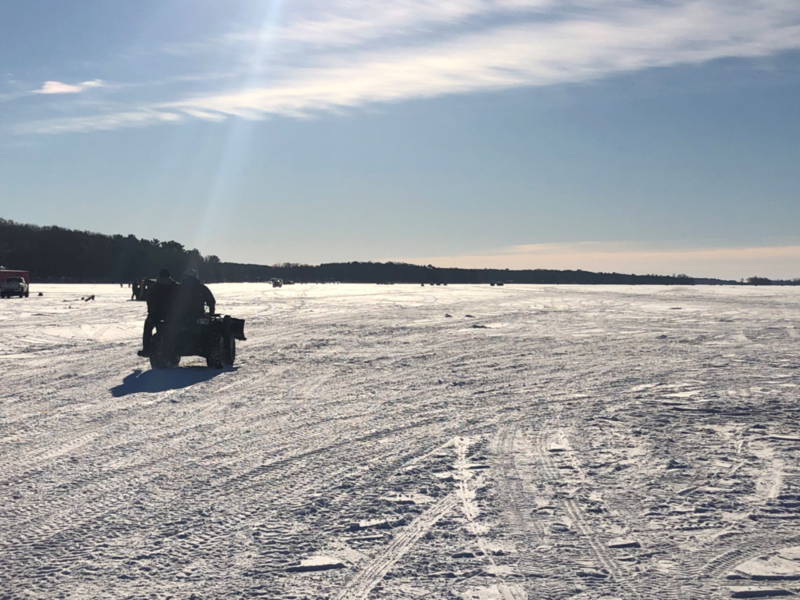 While trucks and trailers filed in, coaches distributed bait, and student fish anglers drove four-wheelers onto the ice to find the perfect fishing spot. For the season’s first event, an estimated 20 high schools attended, breaking up into 70 teams. Schools fish in teams of four, meaning more than 240 student fish anglers came out to compete. For these students, winter means spending time outside for a more nontraditional high school sport. Matt Dunlap is the co-head football coach at the Luck School District. This year, the football team took over the ice fishing event as a fundraiser. 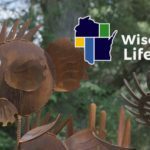 Wendy Dallmann is the President of the Wisconsin Interscholastic Fishing Association and the Head Coach at Prairie Farm High School. 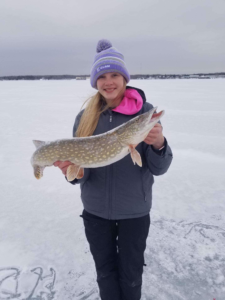 She said high school ice fishing teams started in 2012, but there are already more than 1200 students and 100 schools involved statewide. Prairie Farm, a small high school with only approximately 100 students, had half the school interested in the sport’s first season. 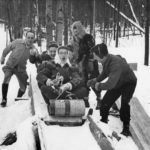 Prairie Farm wasn’t the only school to successfully implement an ice fishing team. Many schools across the state leapt to get student involved. Jack Springett is in his second year at Amery High School, but he enjoyed the winter activity long before it came to his school. 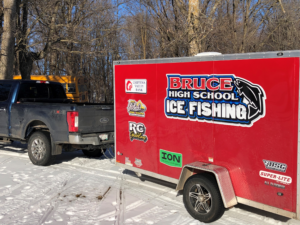 Somerset High School introduced its first ice fishing team this year. Sophomore CJ Peterson hopes he and his teammates can make an impactful debut. “Hopefully we can do good this year. Hopefully we can place in the top 20 schools,” Peterson said. Preparation for the Saturday tournaments starts the week before. Teams pack and organize bait starting a few days before the event. Organizers check ice for the entire week leading up to the tournament to ensure it’s thick enough for fishing. They also prepare raffle prizes and organize team rosters and sign-ups. The excitement and challenges of spending a cold day on the ice don’t stop until the fish are collected and the winner is determined. 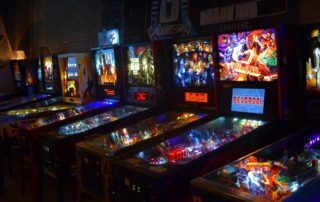 The rules vary at each tournament. In Luck, student anglers were looking for game fish for length and pan fish, which were measured for weight. Most events start at 7 a.m. and continue until all the fish are weighed in around 2 p.m. On the day of the tournament, students have to get up early and head to the lake. Makaylin Christenson is in her second year at Prairie Farm. “I got woke up at 5:30, and I laid in bed until 6,” Christenson said laughing. Once students reach the lake, Prairie Farm Junior Briley Hansen said the day starts with finding the perfect spot to drill and set bait. 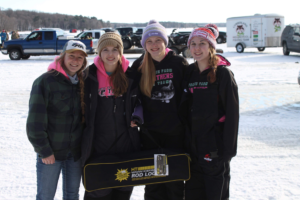 The high school ice fishing season starts at the end of December and can go into March. 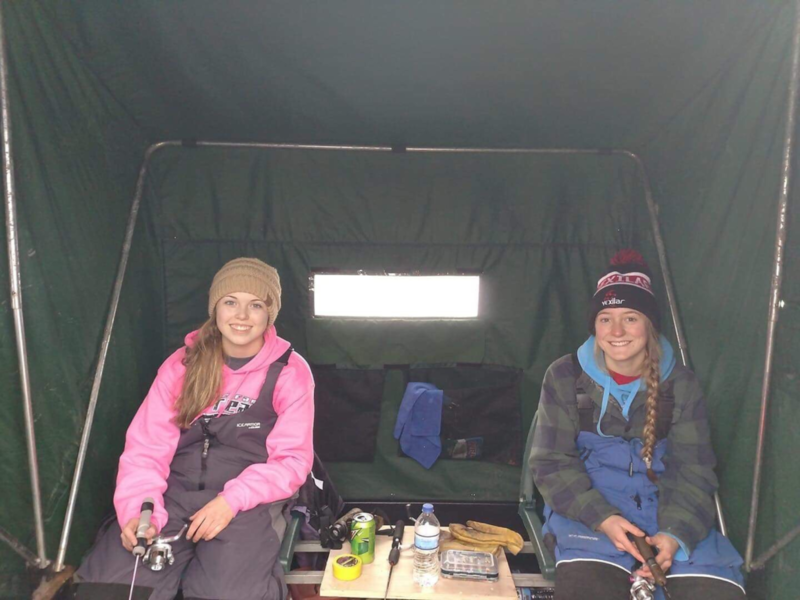 Since the tournaments are on Saturdays, many students can balance their love of fishing and the outdoors with a school sport. Dallmann said being on the ice can teach high school students about balance, conservation, and natural resources. It also gives students with different backgrounds a chance to compete together. Most teams don’t require any experience to join. “I had two girls out here who never handled an ice auger before, and they both drilled their own hole and set their own tip-up,” Dallmann said. 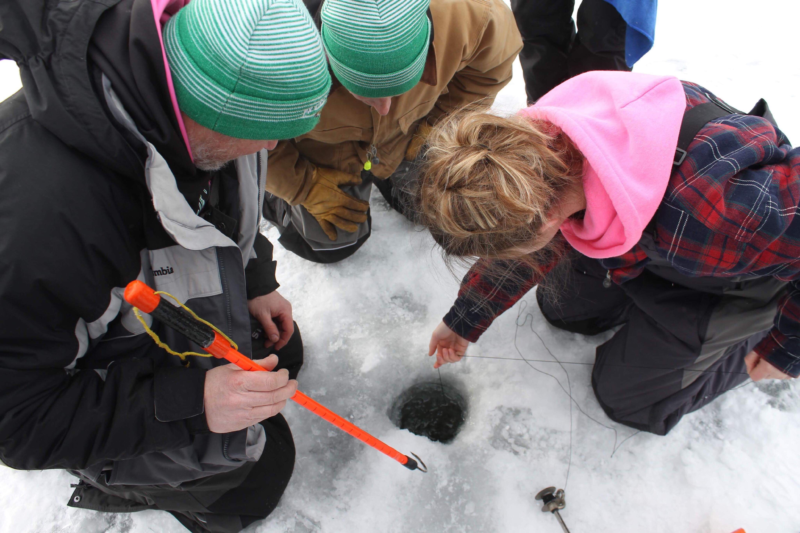 Parents are also encouraged to enjoy a day on the ice with their student anglers. Dallmann said it’s a great opportunity for parents and students to spend time together in an activity both can enjoy. 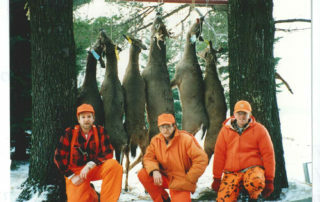 “What a great bonding experience for families to get out with their kids and just be in the outdoors,” Dallmann said. Christenson’s dad, John Barthman, says the family’s love of fishing and great memories on the ice make the cold Saturday mornings worth it. “Sometimes she teaches me. Sometimes I teach her,” Barthman said. Some of his favorite memories have come from days spent in the cold with a pole. Dallmann said creating a team begins with getting permission from a school’s administration to represent the school correctly as tournaments around the state. 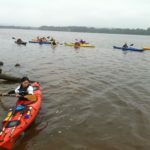 She said the next step is to find your team by posting flyers and utilizing social media to spread the word, then fundraising for equipment, hotel stays, and bait. Finally, you ask permission to attend tournament, and you’re ready to fish! 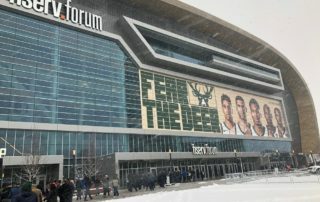 In the future, the sport hopes to expand into the Midwest and create more regional tournaments. 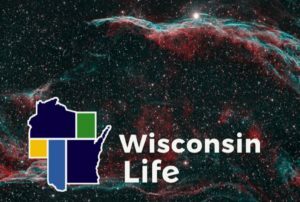 A middle school component is being considered for the state, but Dallmann said there are some challenges that must be overcome first. 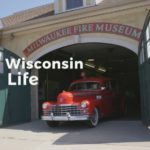 “You have to make sure you have a lot more volunteers out here. 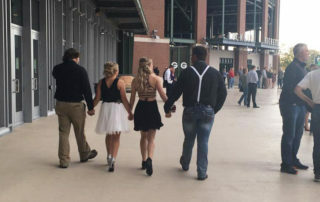 They need a lot more supervision than a high school student, but that’s certainly something that will come,” she said. 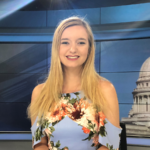 Taylor Pomasl is an intern at Wisconsin Public Radio and senior journalism major in Eau Claire. She grew up in the Northwoods and is a massive Wisconsin sports fan. She loves her home-state because of its dairy-heavy diet.